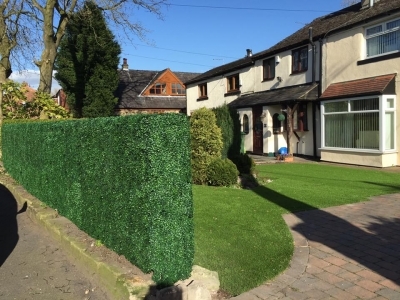 Hedged In is an artificial hedge supplier offering the best quality artificial hedging, hedge panels and bespoke hedge building services in the market today with an affordable price tag. Manufactured on 50x50cm and 100x100cm large hedging tile, our plastic hedges are quick and easy to install simply by clicking each artificial hedge tile together. Made from 100% raw fully recyclable polyethylene, these fake hedges can be fitted in any bend and surface. Our plastic hedges are UV stable and weatherproof, also child and pet friendly, suitable for outdoor use and long term exterior display. These synthetic hedges can provide total screening and privacy fencing. Artificial hedges and screening are extremely lifelike and an ideal alternative garden materials. Hedged In also offer bespoke hedge building services. Whether it is an instant flowering hedge planter for display on your windowsill, a group of hedging planters for screening your front garden, a vertical green wall to decorate your roof terrace or hedge letters for promoting your business, our hands on team are here to help you create your unique hedging.